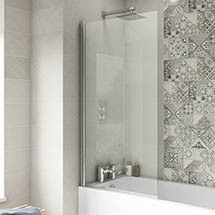 A bath screen acts like a shower curtain but its rigid structure and stylish looks make it a popular alternative for many homeowners looking for something longer lasting and on trend. What is a square bath screen? A square bath screen is a water shield, made from glass, which is usually hinged above the side of a bath where the water from a shower is directed towards. It is designed to stop water from escaping the bath and soaking the floor. 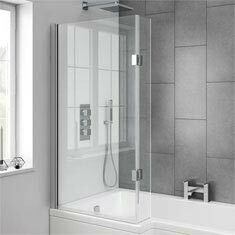 What square bath screen sizes are available? 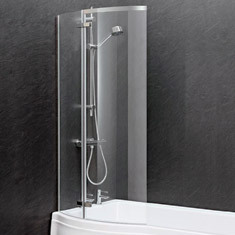 Square bath screens are usually measured in millimetres (mm). 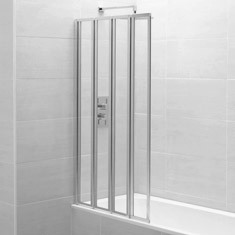 There is a wide variety of square bath screen widths ranging from 243mm to 1500mm although the standard sizes are between 800mm and 900mm widths. The height is usually a standard 1500mm. Installing a square bath screen is usually quite easy however, if you haven't done anything like this before we advise you seek the help of a professional. 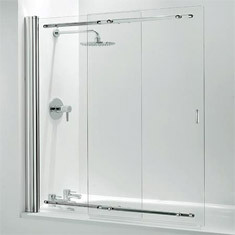 Do square bath screens require much maintenance? 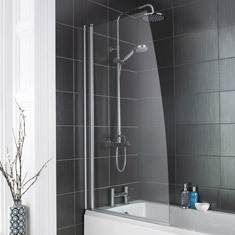 Simple to clean and easy to maintain, square bath screens are a great family choice. A simple wipe down after each use or weekly scrub is enough to keep your bath screen looking good for years! Using a standard cleaner is advised, nothing too strong, and try to wipe down after each use for best results.